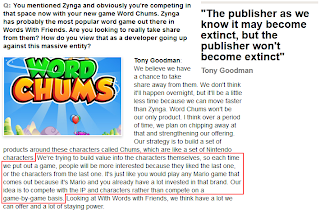 Read a couple of excellent interviews over on GamesIndustry today with Tony Goodman of Ensemble Studios and Feargus Urquhart of Obsidian on how the world of game publishing is changing. 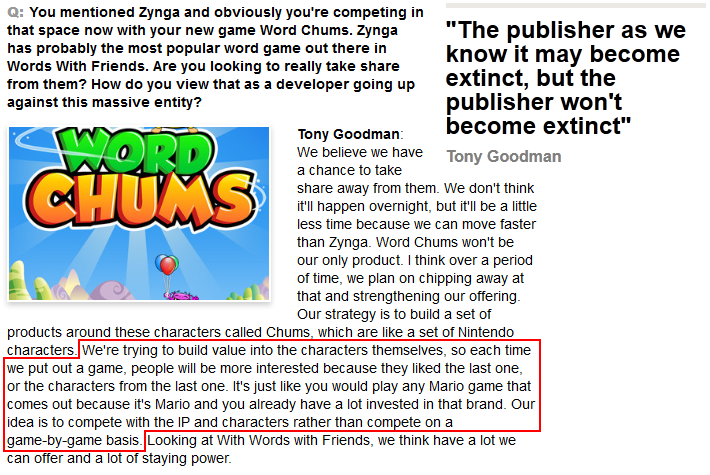 Tony talks about how Ensemble is working to cut away at Zynga's dominance of the casual game market by building their product around characters called Chums. Feargus Urquhart talks about how Kickstarter allows an independent developer to own their brand, and how this can drastically change the power dynamic of future negotiations and product expansions when it's time to get a big publisher involved in the mix. Taken together these interviews align magnificently with Johanna Blakely's TEDx talk from 2010 on how the fashion industry is so phenomenally successful without having the same copyright and patent protections found in the entertainment industries. It's all just kind of wonderfully zeitgeisty for me right now especially when taken in the context of the creative outpouring taking place in the OSR world under the creative commons license, so I'm putting all these links and screen grabs here for easy reference. Garriott did it with Ultima. Blizzard did it with Warcraft, StarCraft and Diablo. Maxis did it with "Sim". Sid Meyer did it with Civilization. TSR did it with D&D. Wizards did it with Magic. Artists that find success during their lifetime do it to their names (Picasso, Dali, Warhol). Authors do it too, like Rice, King, and Crichton. This is probably why JK Rowling is having such a tough time of it right now. Harry Potter is the brand, NOT JK Rowling. Screen grabs of the interviews below the break.